If you are looking for a great budget EDC knife, you may want to consider a knife from Boker. One of their smallest and easy to carry knives is the Boker Magnum Mini Automatic. When closed the knife is under 4 inches long and weighs a mere 2.4 ounces. This means that you can throw it in a pocket and forget that it is even there until you need it. The Magnum Mini is small and light but it lacks nothing in power and durability. The Boker Magnum Mini is a side opening automatic knife with a lot of power. It is two-thirds the size of a full size Boker Magnum knife but has all of the power of the original. These knives are converted with springs that are fast and reliable. You will definitely be impressed with the force that these autos fire the blade into place. There is not a safety mechanism on the Boker Mini Magnum, but Boker did design the firing button to be recessed on the front of the handle which prevents misfiring. The auto deployment feature on this knife is awesome; and it is one of the best features of the Magnum and Magnum Mini. 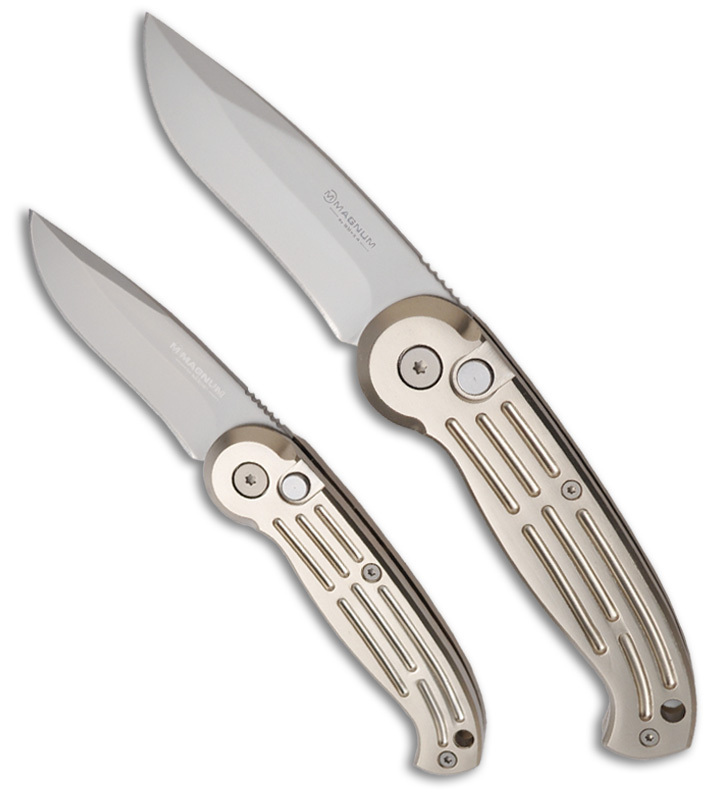 You would be hard pressed to find an auto under $30 dollars that works as well as these Boker Automatic knives. The knife comes in 2 colors: black with a black blade and in a lighter champagne color with a bead blast blade. The handle on the knives is made from anodized aluminum, which is lightweight without sacrificing strength. The blade is made from 420 stainless steel which is strong and relatively easy to keep sharp. It is the perfect length for an EDC (everyday carry) knife at 2.65 inches. This is a great median blade size that is not too small to use or too big to carry in your pocket. The drop point blade is easy to cut with and the shape makes it relatively easy to sharpen. These blades also come with a sturdy tip down pocket clip that make it super easy to carry. The design and extra features that the Magnum Mini comes equipped with make it the perfect choice for a budget every day carry knife. The only slight issue I would see arising from this knife would be the size. Its small size and weight is what makes the knife so convenient, but there are some people who may find it to be TOO small and light. The key word here is MINI; it is supposed to be small and light. This does not mean that the knife is not sturdy. The Magnum Mini feels great in your hand. The design of the handle makes it fit perfectly in the palm and the jimping on top of he blade gives you great control and traction on the knife. If you are looking for an amazing little knife that does not cost a lot of money, then the Boker Magnum Mini Automatic knife is a great choice.